Next week I'll be boarding a flight to Austin, Texas to attend my very first Tableau Conference. In many ways, I can't believe it's taken me this long to attend. To say I'm a fan of Tableau is a bit of an understatement. While it's hard to pin down the specific date, as near as I can tell I've been making charts and maps in Tableau for more than six years (I think this was one of my first, which accompanied this 2010 Vancouver Sun series). Since then, I've created more than 100 Tableau Public charts. I do regular Tableau training workshops and Tableau is a big part of my Data Visualization course at Kwantlen Polytechnic University. So why have I never been to "conference" before? In part, it's because my conference schedule was already pretty maxed out. With two young children, I don't like to be on the road too much. And, as a data journalist, over the past few years I've tried to make it to both the NICAR data journalism conference and Tapestry, the great little data storytelling conference put on each year by Tableau the day before NICAR begins. Tableau often hosts several training workshops at NICAR, and a lot of the Tableau Public folks attend, so going to NICAR felt like I was getting my Tableau fix without having to go to a whole separate conference. However, since leaving The Vancouver Sun last year, Tableau has become an even bigger part of my life. I'm still doing data journalism and teaching the next generation of data journalists at Kwantlen. But I'm also doing a lot more non-journalism data visualization consulting and training -- and almost all of that has been using Tableau. Plus, with NICAR and Tapestry in Florida this year -- about as far from Vancouver as you can get and still be in North America -- I'm probably not going to make it to them this year. 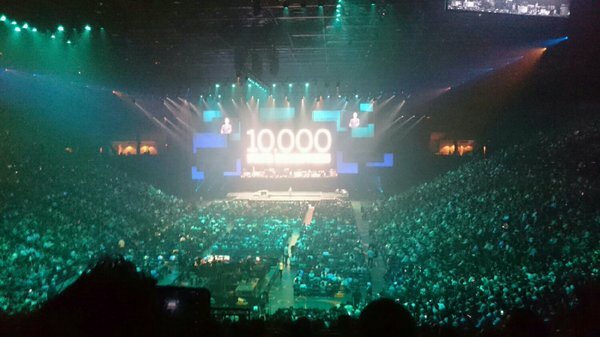 So it felt like it was finally time to see what Tableau Conference is all about. As I prepare for the conference, the one thing I still have trouble getting my head around is how freaking big Tableau Conference is. Tapestry is probably my favourite conference (and I'm not just saying that because I got to give a short talk at it in 2015). 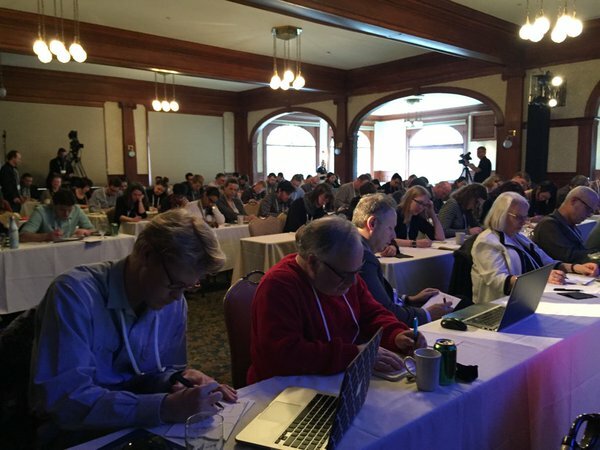 It attracts an amazing mix of academics, journalists and data viz experts and -- at only about 100 people -- you get a real chance to mingle and get to know folks. 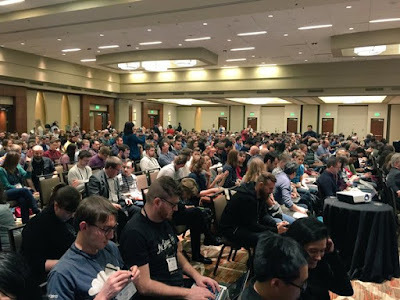 In contrast to Tapestry, I've always found the NICAR conference to be a tad intimidating, with its 1,000+ attendees -- especially when everyone shows up for the lightning talks. 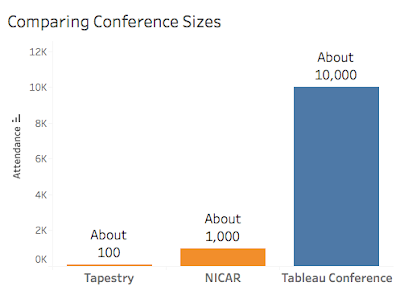 At 10 times the size of NICAR, the Tableau Conference also seems to have (at least) 10 times the number of sessions. 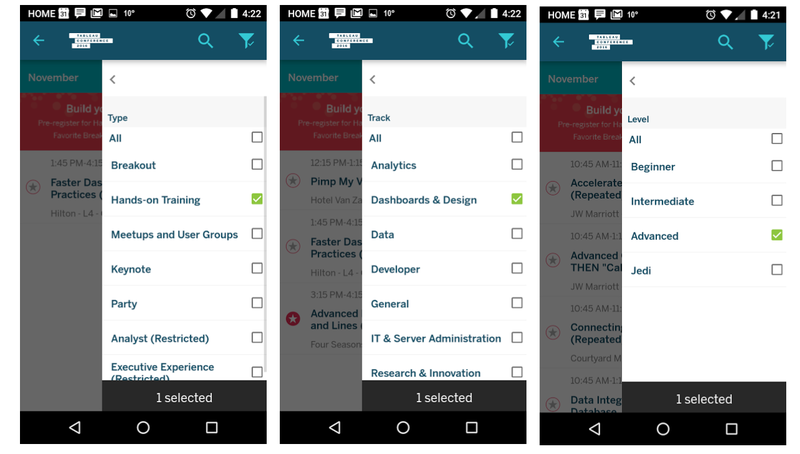 Luckily, the conference app does a great job of letting you filter down to specific session types, topics and difficulty levels. One thing that is both great and frustrating about the hands-on training sessions at the Tableau Conference is that they appear to each be 2.5 hours long. For the most part, I think that's great. The hands-on training sessions at NICAR, with some exceptions, were usually just an hour long, the same length as panel discussions. In most cases, that was only enough time to get a taste of how to do something. In contrast, 2.5 hours is a good chunk of time: enough to learn a concept in some real depth. Heck, my classes at Kwantlen are 3 hours long and we can cover a lot in one of them. What's frustrating about that length, though, is that going to one hands-on training session basically means missing out on two breakout sessions -- or, essentially, giving up your whole morning or afternoon. It also means that, even if you want to go all-in on training, you can really only make it to five hands-on training sessions the whole conference (two a day on Tuesday and Wednesday and then the morning on Thursday). On second thought, frustrating is probably an exaggeration. I'm really just complaining that there isn't enough time to do everything I want to do. I realize it's not fair to expect conference organizers to be able to bend space and time. 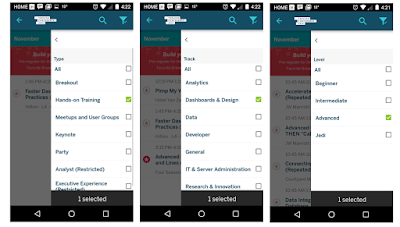 One cool thing about Tableau Conference is how many sessions are repeated, so if you can't make it at one time you can go to another. This avoids the situation I've often felt at NICAR where two sessions I really want to attend are on at the exact same time (that's how I missed Scott Klein's amazing history lecture at NICAR one year; thankfully he did it again at Tapestry). So what am I planning to go to? Well, a lot is in flux at the moment because I'm really conflicted about how much hands-on training I want to do compared to the breakout sessions. I love to learn new things, and there are several areas of Tableau I'd like to know more about (like LOD expressions). But I also think a schedule of nothing but hands-on training will be too much for my brain to handle, so I think I'll probably aim to spend half my time in hands-on training and the other half in breakouts. And, yes, I realize I can't make it to all of those. Luckily, it looks like all of the breakout sessions will be recorded so I can hopefully catch up later on those I miss. The other thing I'm looking forward to in Austin is the food. I'm used to going to NICAR, where you're on your own for lunch. So the scale of food choices available at the Tableau Conference is a bit mind blowing. I'm planning to write some shorter posts next week once the conference gets underway, so please check back for that. And please say Hi if you bump into me in person next week!